I keep hearing that song by Florence and the Machine, "The Dog Days Are Over" and have been trying to reconcile the words with what I know about "dog days." So far, I don't understand Florence, though I still enjoy the song. What I know is that the dog days of summer are usually in July and August, when the weather is worse than awful in Texas. Here we include September as probably the worst dog days of all. From what I recall, this term has to do with the dog star and its position in the sky. Could be wrong. The thing I remember well about the dog days is swimming! I grew up in western NY and not until July was it really warm enough to swim. We had an above ground pool and spent many many hours outdoors. No sunscreen, of course. Just hours and hours outdoors that left me with plenty of freckles. I never enjoyed the sun that much, but I loved swimming, even though when I learned at the Y, the instructor wouldn't pass me because I couldn't swim the length of the pool as fast as the other kids. "Hey," I wanted to say. "I'm not planning on trying out for the Olympics." Now it's my granddaughter's turn to learn to swim and I wish I could be there to watch. No one came with me for the swim lessons. I just walked to the Y by myself. It was free. There was plenty of free stuff in those days. But I did get a treat today--some pictures of her learning how not to drown. What about you? What's your favorite part of the "dog days" that are about to start? Lovely blog Leann. I am not sure we have dog days here in Holland. Some short heatwaves, yeah, but this year the first was in April! And today it is dry and a little bit sunny for the first time in over a week of heavy rain, so it is extremely humid outside. And I have to go to my father's birthday party, sitting outside all afternoon, not going to enjoy that. I do enjoy going to the office and back home while the sun is shining. In winter it is always dark, and you really miss the sun. We sure do have them here in Iowa! There are days it's so hot outside you can't breathe. When I was a child my favorite part of "dog days" was going to the lake with my aunt. We would swin and then take a break for an ice cream cone (you know the twisty kind with the flat bottom cones) Then we'd swim some more Then when it was time to go, we would stop at the snack shack and each of us would get one of the BIG Baby Ruth candy bars. I was the same way Leann, never liked the awful heat but I spent every moment I could in our above ground pool. Even when I was a teen, we wouldnt really swim but me and my friends would spend hours in the water, talking, moving around a little. Here in Michigan the dog days are late July and August. For most of the dog days this year I will be recovering from my knee replacement surgery. by the way, she is adorable....your grand daughter. Okay, I am taking a survey. Holland--not so many dog days, but a few. Iowa and Michigan--definitely. I remember those ice cream cones, Sue. And oh, yes, Lori. Just hanging around in the water learning to talk like a grown-up while making fun of the grown-ups! :-) Hope you knee replacement goes well. I have heard many good things about the results of that surgery. I don't like late July and early August in the city, especially when the three H's are involved. That's why I love a/c and being indoors during those dog days of the summer. Thanks for sharing the pictures of your grand-daughter. Lots of dog days in Ohio but not lately--very wet here. My favorite things about dog days are shorts, tees, and flip flops, ice cream cones, and fireflies. 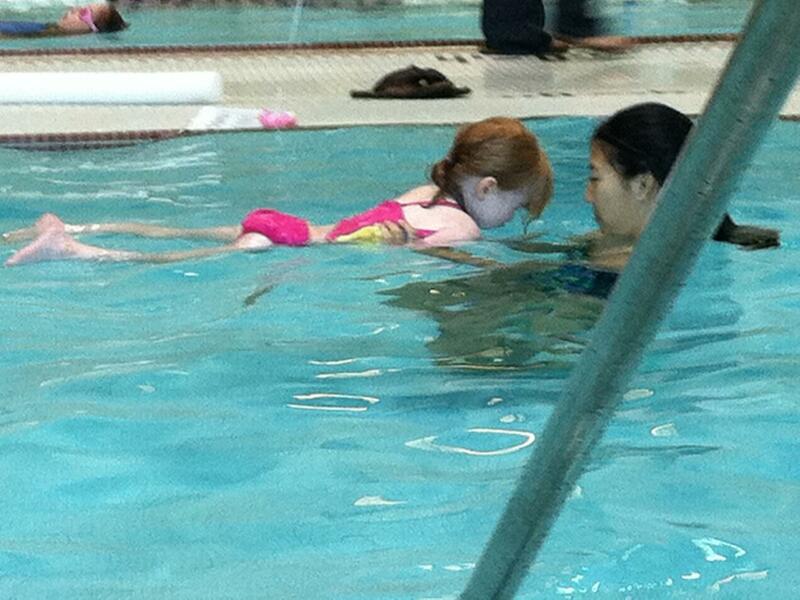 Love the swimming lesson pics--brings back memories of my kids learning! I grew up in Illinois where the dog days of summer were the bane of my existence. The State Fair was in Aug. just when everyone was melting and it was hard to keep animals cool enough. Ice cream was wonderful but chocolate bars had to go in the refrigerator. I would find the coolest possible place and read - just as I do now. NE MS definitely has them! So does Memphis, where I grew up. Best way to cool off: take a cool shower, then sit in front of a fan with wet hair and a bowl of ice cream! Grab a book when the ice cream's gone. Now I have hot flashes too often, so it's try and stay inside with a.c. as much as possible. Long, lazy evenings. Love them! I live in Texas too. Summer starts in April and if we are lucky ends in September. I have lived here most of my life and I cannot get used to the heat. Air conditioning....I wish we had a pool we could get in whenever we wanted. We spent a week at Dad's last week and he has the best in -ground pool.